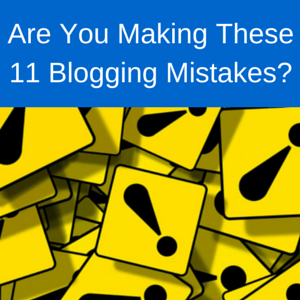 Are You Making These 11 Blogging Mistakes? No blogger knows everything there is to know about blogging. Even the most experienced bloggers are still looking for more blogging tips, tricks, and tools they can use to amplify their authority on the web. You should read at least three articles about blogging every day. You can skim through some articles and just absorb the key takeaways. Regardless of how much of the articles you actually read, you need to read more articles about blogging and absorb the key takeaways. Social media growth is one of the biggest aids towards more blog traffic. Social media provides direct traffic (you tweet one of your blog posts and people click the link) and indirect traffic (social media traffic helps out with SEO traffic). If you are not growing on social media, then you are missing out on one of the biggest streams of blog traffic. Your email list is where the money and returning visitors are. People love to check their email, so that’s exactly where your content need to be—in the inbox. If you are not building your email list, you must stop what you are doing and optimize your blog to get more subscribers. You could get thousands of visitors every day, but if none of those visitors are subscribing, then those visitors may neither come back to your blog nor buy your products. Once you have an email list, it is important to properly communicate with the people on that list. An email list, regardless of its size, means nothing if you don’t interact with that email list. When you interact with your email list, don’t simply tell people that you wrote a new blog post or launched a new product. Let your subscribers know what the product or blog post is about by providing a summary. Then provide the link so your subscribers can either read the rest of the article or see the sales page for your product. Building relationships with your readers is the most crucial step towards getting returning visitors. Building relationships does mean interacting with them through emails (when they join your email list), but that also means responding to comments and making the readers feel welcomed on your blog. I use the WWSGD plugin on my blog to display a welcome message to all of my first-time visitors and a different message for returning visitors. Welcoming your visitors to your blog allows you to build the relationship you have with them. Perhaps the best way to build relationships with your visitors is to respond to their comments. Some visitors will be encouraged to return to a specific blog post just to see if you responded to their comment. In order to make this work, you need a good reputation for responding to other people’s comments. In some of your blog posts, let your visitors know that you respond to other people’s comments. That way, visitors who have read enough of your blog posts will know that you respond to other people’s comments. SEO is another major traffic outlet. Even though billions of people visit Google every month, few people are taking the time to learn SEO and optimize their blogs for the search engines. Some people get hundreds of thousands of monthly visitors from SEO alone, but even if you utilize SEO properly, it is important to not rely on SEO. If Google comes out with another big update that becomes famous minutes after it comes out, the rules of SEO could possibly be redefined. However, it is still necessary to optimize your blog for SEO in order to get more traffic which leads to social media followers and email subscribers. Here are some tips for optimizing your blog’s SEO that work. No matter how much traffic your blog gets, its success comes down to content. The value of your blog’s content is a critical factor that determines how long visitors stay on your blog. If people appreciate the value of your content, they will subscribe to your blog to receive more updates and become returning visitors. Some of these people may even become returning visitors. One of the biggest misconceptions in blogging, marketing, product creation, and business is that the people will come. There are dozens, hundreds, thousands, or even millions of opportunities similar to the one you provide. There are numerous books about making money and become successful. People won’t buy your book just because it is on Amazon. If that were the case, every self-published author would be making a six-figure income regardless of a book’s actual value. You need to differentiate your blog from the crowd. A good design, valuable content, and an interactive section are three of the various ways you can differentiate your blog from the other blogs on the web that are related to yours. If you settle, then you cannot move forward. No matter how successful your blog is, it can always move forward. If your blog is getting 100 daily visitors, it can get 200 daily visitors. If your blog is getting 1,000 daily visitors, it can get 2,000 daily visitors. Even if your blog is getting 10,000 daily visitors, your blog could end up getting 20,000 daily visitors. If you refuse to settle with where you are, you will find a way to amplify your authority and spread your message and content farther. In a joint venture, you and another blogger occasionally promote each other to the other person’s email list. You can go on joint ventures with other bloggers in your niche who would then occasionally promote your content and products. The most successful marketers are constantly promoting each other’s products and services. Ian Cleary and Kim Garst promote each other just as Brendon Burchard and Jeff Walker promote each other. The leaders promote each other and all elevate together. If your blog’s progress has hit a ceiling, that does not mean progress has come to an end. The ceiling just means mistakes are being made. By identifying the mistakes you are making with your blog and doing something about those mistakes, you will break through the ceiling that is holding you back. These 11 common mistakes plague many bloggers. All of these mistakes can be avoided or corrected so your blog sees an increase in traffic. This article was syndicated from Business 2 Community: Are You Making These 11 Blogging Mistakes?